The Automated Flow Cytometry work cell provides scientists with an automated sample acquisition system for screening cells and beads in solution. 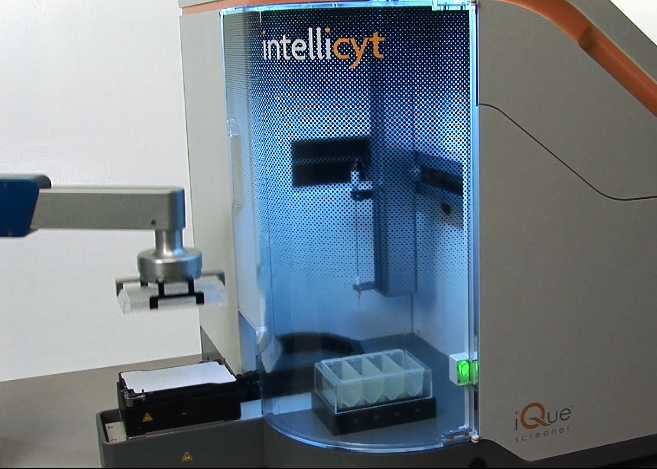 This integrated platform combines the Intellicyt iQue™ Screener with our PlateCrane EX microplate robot arm. Combining the PlateCrane EX with the iQue Screener provides the user with a powerful system for screening large libraries for those that act as desired in various cell and bead-based assays, on a bench top or in a hood. Hudson’s cost-effective workcell offers small footprints for mobility and flexibility, and easy-to-useSoftLinx software for data tracking and scheduling. SoftLinx communicated directly with Intellicyt’s ForeCyt™ software and automatically loads and executes stored protocols. SoftLinx makes it easy to expand your system with the addition of other instrumentation, such as bar code scanners, liquid handlers, heating and cooling nests, and plate sealers. See the Intellicyt website for more details on specific applications. Sampling Manual and with autosampler. Autosampler accommodates 96- and 384-well plates with plate recall auto settings. 1536-well is a planned future capability compatible with current hardware. Software Features Standard: normalization, dynamic linked gating, interactive heat maps, 1D and 2D plot settings, custom PDF data report, well scan, unified work space, custom metrics, automated cleaning, one data file per plate, templates, advanced screening software. File size per 96-well plate: 70-100 MB. File export: FCS, CSV and ForeCyt plate formats.